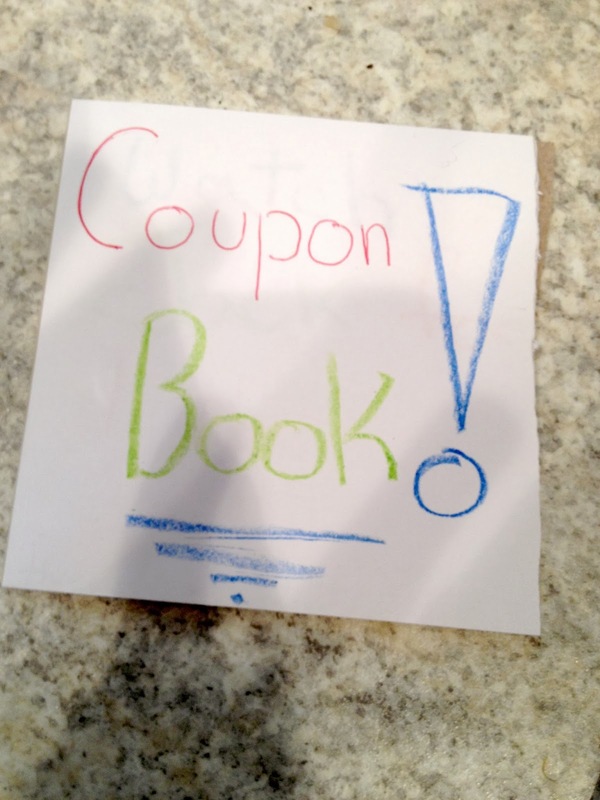 The Kids Made Me Fat: A Coupon Book for Christmas. A Coupon Book for Christmas. Hadley's affection is hard-earned. She keeps it close to her and only doles it out on rare occasions. Perhaps these occasions coincide with the moon - maybe her heart opens and closes on a lunar cycle, I'm not sure, but maybe I should start keeping a chart? Hugs? Forget it. Snuggles? Ain't happening. However, because it's my job to smother her, I'm always throwing my arms around her while she flails in protest. She may not like it, but it is my god-given right to hug her. So hug I do - though I sometimes end up bruised as she shoves me away. Bruised in my heart, that is. Sob, Sniff, Poor Mommy. So it was quite a Christmas miracle when on Christmas Day, Hadley hugged us all and presented us with gifts that she had made and wrapped herself. My little Grinch's heart had grown so big that she was oozing love and holiday joy. My present was a coupon book. She filled it with coupons that I could redeem for help around the house. Her coupons included things such as, "Watch Jack for 30 Minutes," "Clean My Room," and "Pick Up The Toys." I thought it was wonderful. Without any money to spend, Hadley had created the perfect present. A week later, on my birthday, the only thing I wanted was to take a shower. I remembered my coupon book and asked Hadley to watch her brother. She told me she was busy. I told her that it was my birthday, and I would like to use my coupon. She put her hands on her hips as she then said, "Mother. You need to look at those coupons. They have expired." I got out the coupon book and sure enough, she was right. Damn it. I forgot to read the fine print. All of the coupons were good for 3 days only and apparently, she was not going to honor them. I went to her room and asked for an extension. In honor of my birthday I begged her to honor her coupon. She agreed to extend only the coupon to watch Jack, but because it was expired she'd have to cut the time from 30 to just 20 minutes. How was it that I'd come to live at the mercy of an 8 year-old? While I was starting the shower, I heard a crash and ran naked into my bedroom to find Jack who had taken the tray of jewelry that sits on top of my dresser and dumped it on the floor. "JACK! Pick that up!" I screamed. "Hadley!!!!" I yelled. "You're supposed to be watching him!!!" Hadley sauntered into my bedroom and said, "Well, yes mother, but you get what you pay for." And that little Grinch's heart shrunk back down to size. I guess I'll have to wait until the next full moon for a shower. Oh my gosh....I'm laughing out loud. She will run the world one day.